The illegal wildlife trade generates between US$7 billion and US$23 billion annually and threatens many of Africa's species with extinction. See the bigger picture with this inforgraphic from AWF. Governments, conservation groups and citizens around the world will celebrate World Wildlife Day on March 3, but the celebrations may be muted as many of the planet’s species face the threat of extinction. This year’s theme—“It’s time to get serious about wildlife crime”—focuses attention on wildlife crime, in particular the illegal wildlife trade, which generates between US$7 billion and US$23 billion annually. African Wildlife Foundation (AWF) has committed a US$10 million through its Urgent Response Fund to stop poaching, wildlife trafficking and demand for wildlife products. Kenya and Tanzania. AWF is supporting anti-poaching patrols in southern Kenya and northern Tanzania through its partners, Big Life Foundation and Honeyguide Foundation respectively. Their extensive informant networks and use of tracker dogs have led to the arrest of a number of known poachers and resulted in a significant decrease in elephant poaching. Zambia. AWF’s support of Lusaka-based Game Rangers International and the Zambia Wildlife Authority’s Intelligence and Investigations Unit is strengthening protection and security around Kafue National Park—Africa’s second largest park—and netting a number of elephant poachers and traffickers throughout Zambia. In December 2014, the Intelligence and Investigations Unit arrested one of Interpol’s “Most Wanted” environmental fugitives, Ben Simasiku, wanted for ivory trafficking. China. A new survey out of China suggests a growing public awareness in the country about ivory and rhino horn trade and the trades’ effect on the current poaching crisis. Chinese consumers are increasingly calling for more government action to help stop poaching and wildlife trafficking. Conservation partners WildAid, AWF and Save the Elephants will release results from the survey on Monday, March 2. Sniffer dogs. AWF aims to disrupt the flow of ivory, rhino horn and other wildlife products from the continent under a new initiative that is training sniffer dogs to be deployed to airports, seaports and key border crossings in Africa. The first class of dogs—from breeders in Europe—has acclimated to equatorial Africa and is undergoing training in Tanzania. Law enforcement training. With funding from the U.S. Department of State’s Bureau of International Narcotics and Law Enforcement Affairs, AWF and its partners are building the capacity of wildlife authorities and related regional agencies to detect and prosecute cases of wildlife crime. AWF is specifically analyzing wildlife laws in different countries, and will provide prosecutorial and legal training around the laws. Central and West Africa. In spite of their isolation, few remote areas in Africa remain safe from poachers. Because of their remoteness, however, it is often difficult for governments to safeguard these areas for forest elephants, chimpanzees and other wildlife. AWF has partnered with a private security firm to train rangers in anti-poaching and counter-guerilla tactics, as well as combat skills, to bring wildlife law and order to remote areas in Central and West Africa. 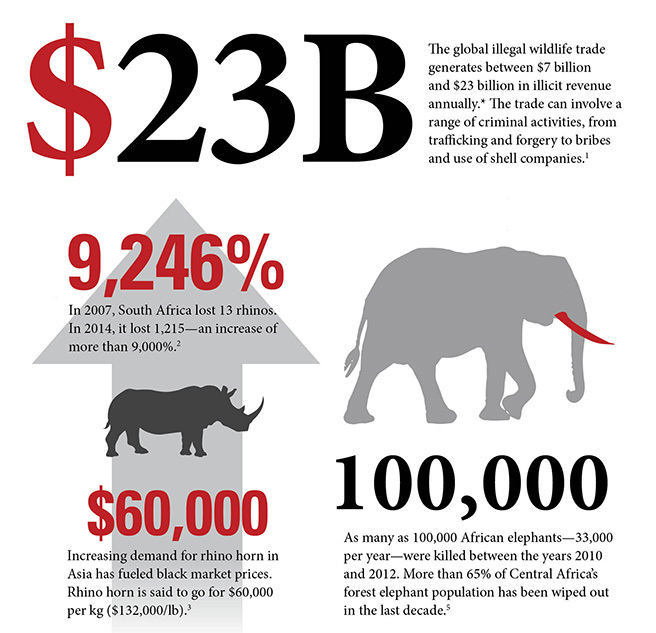 Download the full 2015 Wildlife Crime Infographic.